SCHOOLS — WHY AM I YELLING? Technology, academic & social pressure, peer competition and FOMO are all contributing to the rising levels of depression and anxiety in our children. It’s our responsibility as parents to raise our children with love, encouragement and guidance. Our kids need more emotional and mental support. They need to experience the joy of human connection. They need more cultural stimulation. They need more FUN! The most important job I will ever have is being a mother. And as a mom to two boys (one teenager), I am very aware of all the stressors that surround them in their daily lives. Pressure to perform academically, athletically and socially. Pressure to be good humans and be vigilant about their actions. It’s can be overwhelming and too much for them to handle at times. We’re not letting our children fall down, get up and dust themselves off. We’re not allowing them to feel failure. We are doing them a disservice and we have to stop it. We have to give them space to grow and explore on their own. We have to teach them the importance of self love and acceptance. We are their number one support system. It’s time to give them the foundation and tools they need to create their own loving, thriving relationships. 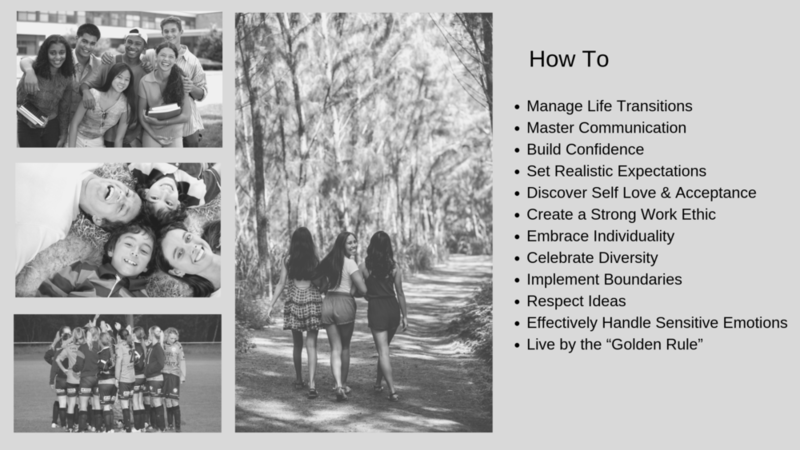 In this presentation, I explain directly to our kids why the foundations of Inspiring Transformation are so important and how to use them throughout their lives. High school students are in the most important phase of their lives. A place of rapid growth and change - physically, mentally, emotionally and hormonally. Providing them with the tools they need to help them understand how to handle any situation during these formative years, will give them a leg up when it comes to their success. I present this program from a place of personal experience, parenting, and years of coaching my clients on how to successfully create change in their own lives. I engage my audience with questions and encourage feedback. My enthusiasm and passion for our youth is infectious and I am on a mission to make sure all of our young people know how to create loving and powerful relationships. To make sure they are ready to make their mark on the world in a positive way. Our children deserve to have the ability to work on their interpersonal skills, to continue their education via traditional and non-traditional teachings, and to embrace the way the world is changing. Teaching topics can be modified based on the needs of the audience. I can create a customized program for your school - let’s chat about how to make that happen! On our initial call we will dig into the current environment of your school. I’ll be asking questions about your curriculum, student activities and teaching methods. We will discuss the mission and vision for your school and students so I can better understand your needs. From this conversation I will create a presentation that is engaging, heart felt, and educational for your staff and student body. This is where the magic happens! When I’m delivering a high energy keynote, my number one priority is to achieve a transformational result for your audience. Because we’ve taken into consideration the needs of your students and staff on the front end, the presentation I deliver will specifically address the goals you want to achieve. The “Inspiring Transformation” keynote includes engaging discussion, idea sharing and of course, question & answer opportunity. It’s my goal to make sure each of your students has a clear understanding of the knowledge I’m sharing so they can incorporate it into their daily lives from that moment. I love keeping in touch with my clients - especially the schools I have the privilege of visiting! Follow up visits, customized workshops and email correspondence is available. I will check in periodically to offer additional support and get your feedback.